3. URL of spoof website disguised as " http://home.chkpcc.net/.update/aw-cgi/ws2/SignIn.html?eBayISAPI.dll=username&value=0:US"
4. Real URL looks nothing like eBay! 5. Website traced to Causeway Bay, Hong Kong.
" 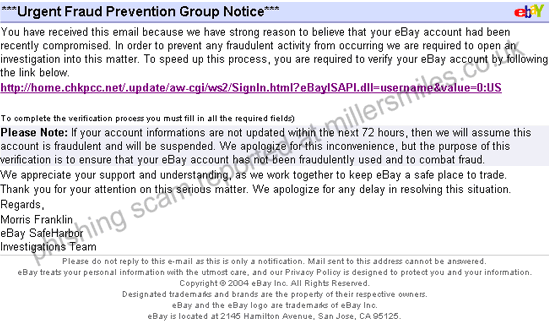 You have received this email because we have strong reason to believe that your eBay account had been recently compromised."